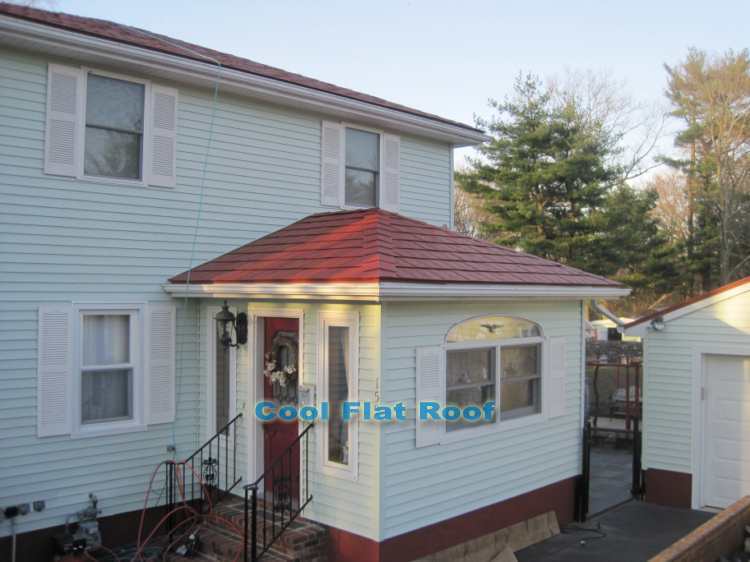 Once the old roofing was stripped off, we installed GAF Deck Armor breathable synthetic underlayment, and sealed all penetrations, such as chimney flashing, vent pipes, etc. 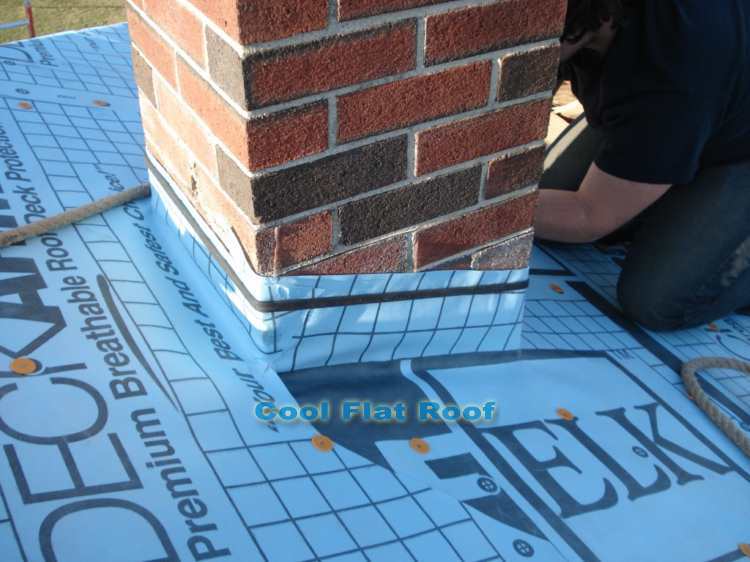 GAF deck Armor is an excellent underlayment product that works like human skin – it allows condensation to escape from the underside, while keeping water from penetrating inside the house. Deck Armor can be installed without the metal roof on it for up to six months, and will keep the roof water-tight. 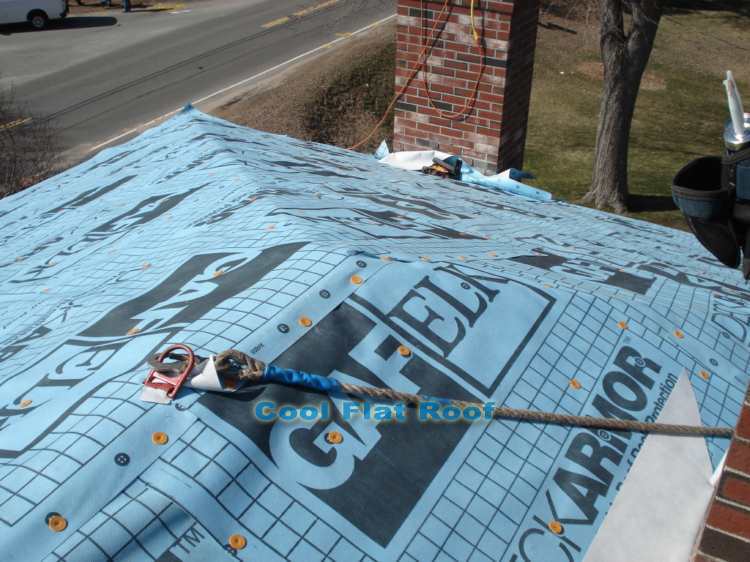 After six months the UV radiation will begin to wear down the underlayment, but the roof will still hold off the water. After tear-off was complete and underlayment installed, it was time to install the metal roof. First, we installed all trim along roof edges. The trim was custom made with the vented bottom to allow the soffit – ridge vent system to work properly. Since the house had no overhangs (soffits), the vented drip edge was the only way to allow adequate air intake into the attic space. After the starter trim was installed, we started installing the metal shingles, working our way from left to right, and up the roof slope. We also had to maintain the correct stagger pattern for vertical impressions in the steel shingles to maintain a straight line and system integrity. We also had to work our way up the hip, so each next course of shingles shifted right by about a foot. As we were installing new courses of shingles, we flashed all roof penetrations along the way. 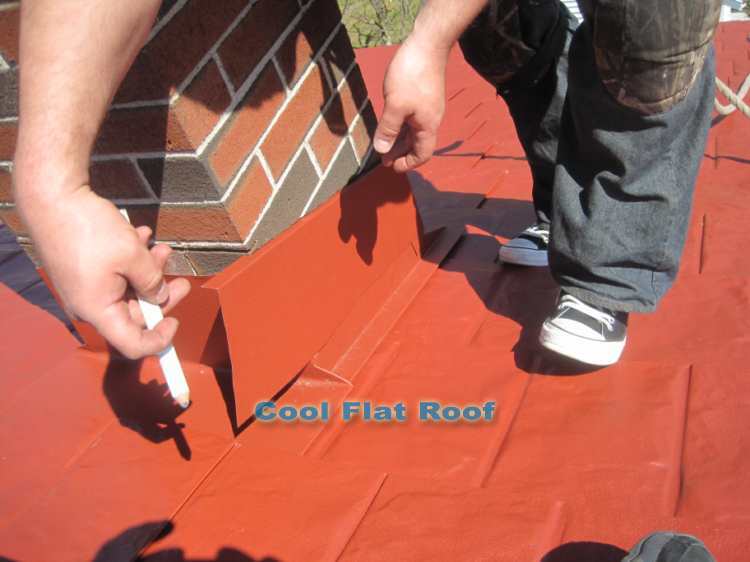 Pipe flashings are rather simple to install, and do not take a long time. The most time-consuming flashings are those around the chimneys and skylights. 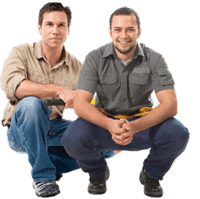 The amount of preparation work and actual flashing time can be well over 5 hours per chimney or skylight. First, the old flashing must be completely removed and the chimney must we wrapped with the underlayment, and be completely water-tight. It is also better to cut the channel for counter flashing before the underlayment is installed, as brick dust on the underlayment is difficult to clean off. Sometimes due to time constrains, this is difficult to do. Once the chimney is properly wrapped with underlayment, you don’t have to worry about rain (it will not leak) and can install the metal roof at a comfortable pace. Once the shingles reached the chimney, we began installing custom fabricated chimney flashings. Starting with the bottom side of the chimney, we first installed the head-wall flashing, that overlaps the course of shingles below. After the head-wall flashing, we installed side-wall flashing that overlaps the head-wall flashing and channels all the water down, away from the chimney. Once the bottom and side flashings are installed, we can continue running shingles past the chimney, all the way to the top of the roof. The chimney flashing is no longer holding us, as the back-pan flashing can be installed at any time now. However, we do install the back pan flashing right away, so that we do not need to come back to it. Once all the chimney flashings are installed, it is time for counter-flashing or “chimney-collar” which is an “L” shaped flashing inserted in the channels that we previously cut in the brick. Counter flashing will divert all water that is running down the chimney and prevent it from going behind chimney flashing. Once again, we started at the bottom, so that all counter flashing would be overlapped in the right direction, as to not let the water penetrate inside and behind the flashing. We pre-measureed and cut / bend all four sides, and marked all bends, before the final installation. After we knew everything fits, we removed all flashing, inserted a thick bead of Solar Seal 900 caulking / adhesive into the channels in the brick, and then inserted the counter-flashings, starting at the bottom. 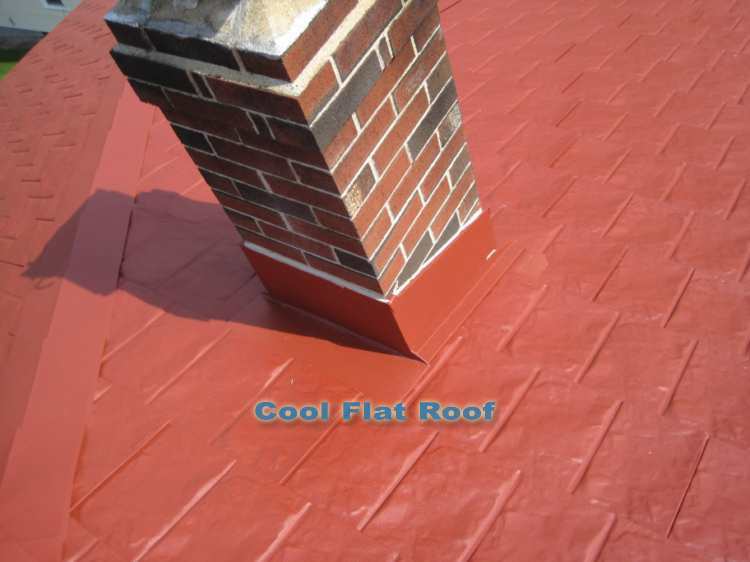 Chimney and skylight flashing are among the most common leak spots on any roof, along with the valleys. 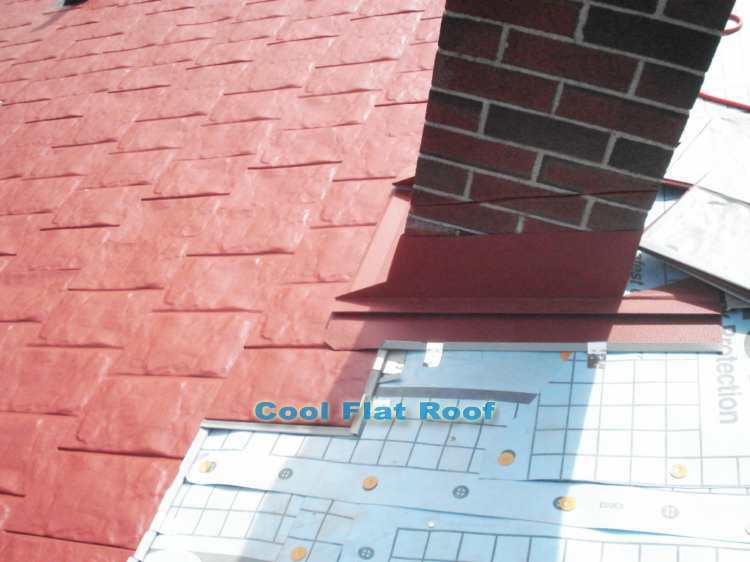 Improper flashing around the chimney is what causes most leaks, and this is especially true for metal roofing. Installing shingles on a straight run roof is easy, and it’s almost impossible for such a roof to leak, even if the roofer installing it has never installed a metal roof before. 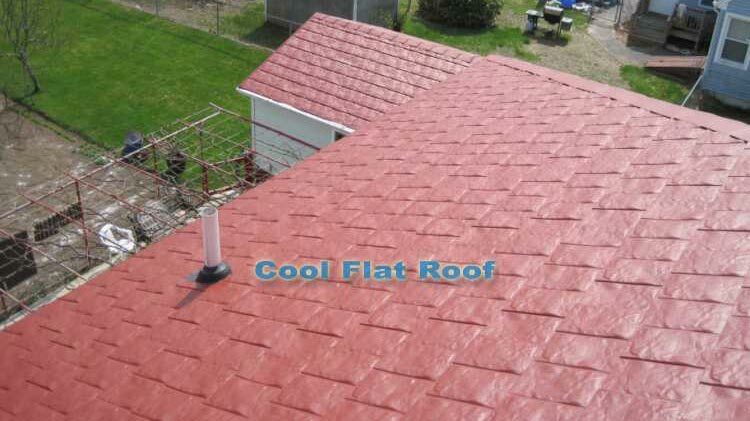 of metal roof failures and leaks are caused by improper installation – NOT material failure. After flashing the two chimneys, we finished installing shingles on all four sides of this hip roof. Now the roof needed to be finished off with Ridge Vent and Ridge / Hip Caps. We marked a straight line using a chalk line tool, so that the hip caps would lay in a straight line and look beautiful from the ground. We started installing ridge caps from the bottom up, and finished it when we reached the ridge line. Then, we installed the ridge caps, and the main roof was complete. Now it was time to install the metal roof on the additions below, as well as on the shed, and on the garage. With the main roof out of the way, we could tear off the shingles on the addition bellow it, without worrying that debris will fall on the new metal roof. We also removed vinyl siding along the roof to wall connection so that we could install the underlayment and metal roof sidewall flashing. 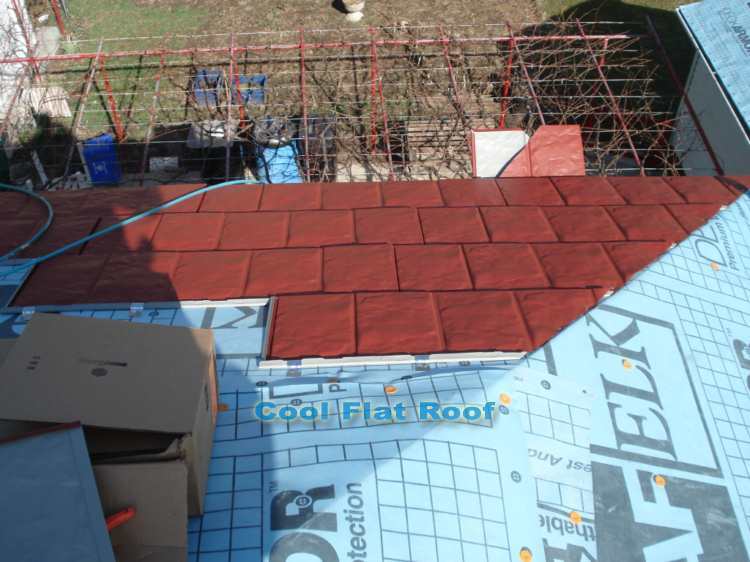 Once the underlayment, drip edge and side-wall flashing were installed, we started putting up shingle and ridge / hip caps – basically repeating the upper roof installation, on a smaller scale. We also installed metal shingles on another bump-out in the back of the house, an awning in front and a bay window, as well as on the shed and on the garage in the back. Now this house in Attleboro, MA looks amazing with the new lifetime metal roof, which will not only protect the home from leaks and ice dams, but will also reduce energy costs during hot summer months. 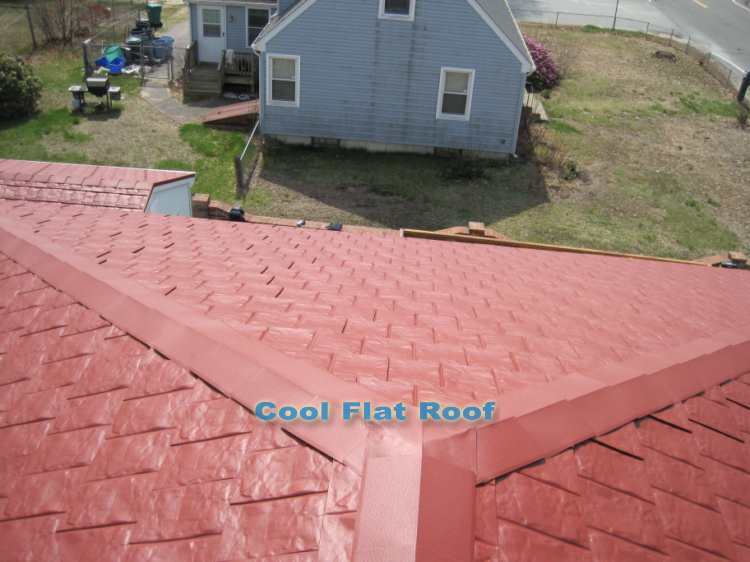 Moreover, this roof qualifies for $1500 federal tax credit for cool roofs! 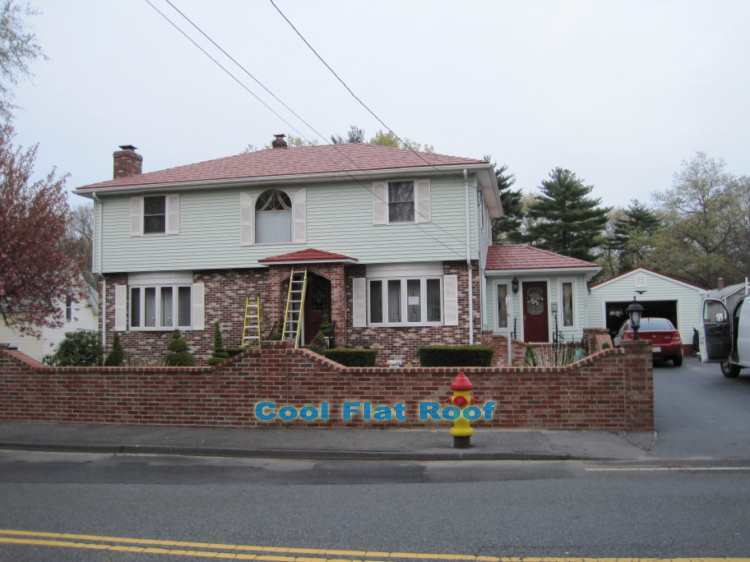 Check out other metal roof installations that we have recently installed – check out our Massachusetts roofing projects. Also check out our metal roofing prices guide to learn how much a metal roof will cost, and compare metal roof prices for different materials – aluminum, steel and copper, as well as different systems – metal roof shingles, standing seam roofs and tiles / shakes. We also recommend that you check out what type of metal roofing materials we install in Connecticut, Massachusetts and Rhode Island.